Johnson Concrete Products (JCP) drywells are precast, reinforced and perforated concrete cylinders. Also frequently referred to as cesspools, our wells are for use in Class V category solutions. We offer drywell rings in industry-standard diameters of 48 and 28 inches. We stock ring sections in a variety of sizes. The sections can be stacked to create a pipe of the desired depth. JCP can deliver and set rings for you. Attention: We aren't responsible for rings that are broken once they leave the premises. It's a bummer when breakage happens, and we sympathize. However, we won't replace them free of charge. Drywell/Septic lids. Drywell lids come in 56” ($105) and 28" ($75) sizes and have a 10"x10" access lid. Manhole Lids. Manhole lids ($145) have a large center hole. You can add a metal insert for $600. Sump Lids. The sump lid ($130) is our thickest lid – designed for highly trafficked, drive-on areas. A drywell is a perforated concrete cylinder that collects storm-water runoff and seeps it into the ground to reduce runoff. Drywells are buried underground and surrounded with gravel. Drywells are also known as underground injection control (UIC) systems. They are the best management practices (BMPs) to minimize the damaging effects of increased storm-water runoff volumes on the aquatic ecosystem. Dry wells can be used in a variety of situations but are especially useful in areas with clay soils to help facilitate the movement of storm-water runoff below the constricting clay layers. They are relatively easy to construct; and require little land area as they are installed vertically, 10 to 30 feet deep. Rings with a diameter of 4 feet are the most commonly size. A foot of clean, washed, storage drain rock is usually placed around the outside of the drywell as backfill. Our wells are for use in Class V category solutions. Refer to Portland’s Stormwater Management Manual for details on sizing, placement and design. For more information, please refer to Oregon’s Experience with Dry Wells: The Underground Injection Control Program (PDF) and the City of Portland Drywell Fact Sheet. What are Class V wells used for? EPA estimates that there are more than 650,000 Class V wells in operation nationwide. Most of these Class V wells are unsophisticated shallow disposal systems. What exactly is a Class V well? A Class V well is used to inject non-hazardous fluids underground. Fluids are injected either into or above an underground source of drinking water. Class V wells include any wells that are not already classified as Classes I-IV or Class VI wells. This diverse group ranges from simple shallow wells to complex experimental injection technologies. More sophisticated Class V wells may rely on gravity or use pressure systems for fluid injection. Some sophisticated systems include advanced wastewater disposal systems used by industry, experimental wells used to test new or unproven technologies, and systems used to inject and store water for later reuse. The drywell must be at least 10 feet from your house and any other buildings that are level with yours. The drywell must be at least 25 feet from buildings that are downhill from it. Refer to the sizing chart. Decide what size storm you would like to store and infiltrate in your drywell. Refer to the sizing chart. Decide what size storm you would like to store and infiltrate in your dry well. Find the closest number in Column A. About one-third of storms in the Philadelphia area result in 0.25 inches or less of rainfall. 60% of storms result in 0.5 inches or less, and 85% are 1.0 inch or less. Estimate the roof area draining to the dry well (length [ft.] x width [ft.] = area in square feet). Disregard roof slope. Find the closest value in Column B for the storm depth you have chosen. At this point, you have narrowed your choice down to just one line of the table. 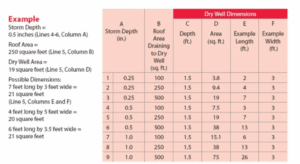 Find the area required for your dry well in Column D. When you multiply your dry well length and width, the resulting number (area) needs to be at least as great as the number in Column D. Columns E and F show examples of lengths and widths that will work. Determine whether your yard and budget will allow you to build a drywell of this size with a safe overflow. If not, choose a smaller storm and repeat the steps. Storing a larger storm provides a greater benefit, but also requires more space and costs more. Storing even the smallest storm in the table will provide benefits. The dry well should have a safe overflow, such as an overflow to your yard drain. In larger storms, your drywell will fill up, and you need to make sure that the overflow doesn’t damage your property or your neighbors’ properties. Keep in mind that the yard drain has to be slightly downhill from the drywell.